Yesterday,I received a copy of "Early Schwalm Whitework" . The author is Luzine Happel who has earlier self published several books on Schwalm Whitework . I had reviewed her Basic Principles of Schwalm Whitework and had even started off the project based on her book.You can read about it here and here. Now, you may wonder - if she has written a book on basic principles,then why another book on early Schwalm Whitework ? That's because,while present day Schwalm Whitework is a drawn thread method,the early Schwalm was a surface embroidery method.Its origins were during the mid-1700s. Pretty old,right? Schwalm whitework uses coral stitch for outline and the surface resembles a lace,whereas early Schwalm is stitched with stem stitches ,different weaving techniques,interlaced stitches and lattice work.If you want to know more about Scwalm whitework check out this Essay on Scwalm at Heritage Shoppe. Interestingly when I googled "Early Schwalm Whitework", the only links I could find were to Luzine's own web page where she gives us a bit of history and another link to Schwalm page of Nordic needle which tells us that it is difficult to find the early examples of Schwalm. What does that mean? - It means that currently this book is the one and only one of its kind and so this is the definitive guide on an 18th century technique. The pattern seen on the cover is one of the elements you'll learn to stitch using this book. The book starts with a picture of Early Schwalm work and its history.If you're keen to work on this design,a pattern is provided at the end of the book. The instructions in the book are based on elements in the pattern above which is a rather long one.In another part of the book Luzine shows the complete worked design. Every stitch has been explained in a detailed way with lots of pictures.There are quite a lot of grid based weaving and interlacing involved.And it would require a certain amount of reading ,concentration and practice to stitch up some of the designs. Since there is lot of grid work involve,Luzine has provided assistance tools at the end of the book,which are basically graphs that you can align with the pattern and draw. Surprisingly,it is after all the instructions that Luzine tells us about the materials required and lo and behold,the table of contents appears at the end. 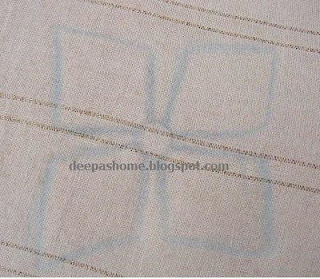 For this type of embroidery,the coarse linen with low thread count is not suitable ,only very fine linen would do. The table of contents is rather descriptive,since each type of method has several variations.Towards the end of the book you'll find about 7 transparent sheets with design outlines that you can use.These are the motifs that have been explained in the book. The book is about 32.71 Euro for buyers outside Europe.It may seem expensive,but for the one and only one book(as far as I know) I think it is worth a one time investment .It has to be ordered from Germany directly from Luzine .You can contact Luzine directly for the book and she will send you a Paypal invoice Her e-mail is leuchtbergverlag [at] aol [dot] com. So, what do you think? Worth going for? I think this is a book that deserves to be in an embroiderer's library.Since the book was originally in German, the English translation seems to be a little tough to read and understand and there's a lot to read,but the pictures make up for the lack of fluency. Last year ,I had purchased some Linen from a local store - I need to check it out to see if I can try a design from this book.We usually do not get the kind of linen used for Schwalm locally,so my attempt may be just a trial to see if the local linen works or not. Thanks for sharing the information. Happy stitching! This looks like a wonderful resource - will have to put it on my wish list (which seems to grow longer every day!). What a special type of embroidery, it looks very beautiful. I am curious to see what you are going to make. I have come over to see your post on Schwalm whitework. I am glad you have started a discussion on Stitchin Fingers and look forward to see what you will be stitching. I came across your blog while searching for online sites to buy embroidery kits. And by the way do you know from where can I order embroidery kits. I am also based in Bangalore but at this point in time confined to home so looking for some online options.